Imagine a menacing spacecraft ominously hovering over a metropolitan city. Or someone running terrified, falling and stumbling through a dark patch of the deep woods. Or a car chase on the freeway in rush hour traffic. Or a squeaky door, slowly opening… What do you hear? 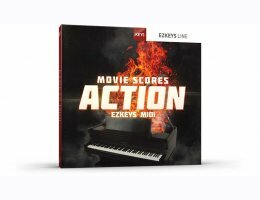 This collection of EZkeys MIDI has captured every thinkable narrative suited for your action- and suspense-packed soundtracks or song ideas. Expect anything from the haunting, ghastly and deceptively calm to the pulsating, menacing and percussive. Inspired by the great composers of film and TV, like Michael Giacchino, Hans Zimmer and Ramin Djawadi, this is an EZkeys MIDI pack where harmony meets disharmony and where extremes on both ends come full circle – designed to let you scale the heights of your own creative self. Drag, drop, combine, change and rearrange. Windows 7 or newer, Pentium 4 or Athlon processor with 2 GB RAM. VST, AAX or RTAS host application and professional sound card recommended.